Kostaki Peev was an eminent public and business figure. He was tradesman, member of the of the Furriers Guild in Plovdiv. After the Liberation in 1878, he became the first elected Mayor of Plovdiv (Dec.1878 - Sept.1880) - he took office on Dec.19, 1878. He was twice elected MP. 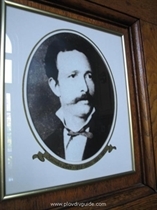 Deputy Chairman of Plovdiv Chamber of Commerce, and later declared its Chairman of Honour. He died in Plovdiv in 1920.